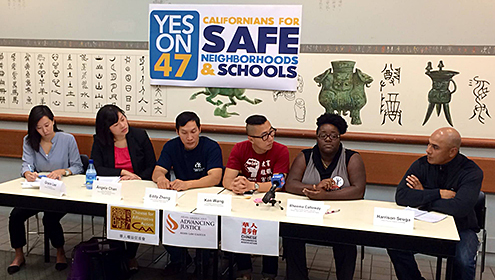 CAA staff co-hosted a press briefing in support of California Proposition 47. Participants included Asian Prisoner Support Committee from AACRE, Chinese Progressive Association, Advancing Justice - Asian Law Caucus, and POWER. For the November 2014 election season, Chinese for Affirmative Action has developed the following voter recommendations for one California and four San Francisco ballot measures. These five measures resonate with our civil rights and social justice values. As we considered each measure, we weighed the particular impact it would have on our most vulnerable community members — especially those who are low-income, immigrant, and part of working class families. A bilingual PDF version of our guide can be downloaded here. Invest in schools, not prisons. Prop. 47 would reclassify many non-serious, nonviolent crimes that are currently either felonies or misdemeanors to simply misdemeanors, reducing the costs of excessive incarcerations. For decades, the California criminal justice system has been enabling an out-of-control prison industry that disproportionately harms people of color. Prop 47 is a step in the right direction by redirecting an estimated $200 million in prison savings to more effective public safety measures, and education and treatment programs. Protect $125 million of funding needed for schools and early childhood and youth enrichment programs. Measure C renews the San Francisco Children’s Fund and the San Francisco Public Education Enrichment Fund for the next quarter-century. These funds are needed to support and continue a wide range of youth and children programs including those that address early childhood education, counseling, sports, libraries, arts and music. Fund healthy recreation and nutrition programs and discourage excessive soda consumption by young people. Health problems such as childhood obesity and type 2 diabetes disproportionately harm our community members who are the most vulnerable. Research suggests that this proposed tax on sugary beverages in San Francisco will discourage soda consumption by young people who are most at risk. Measure E will also raise funds for health, nutrition, physical education and recreation programs. Protect the diversity and stability of San Francisco neighborhoods and reduce unnecessary evictions. The housing crisis in San Francisco is displacing low-income and working class families at an alarming rate. Measure G can slow it down. By increasing the tax rate on property that is “flipped,” unnecessary evictions can be prevented and diverse neighborhoods can be protected. This is a targeted measure to reduce the negative impacts that real estate speculation can have on the stability and affordability of San Francisco neighborhoods. Increase the minimum wage to support all workers and strengthen the local economy. A gradual increase to a minimum wage of $15 per hour in San Francisco is a common sense solution for a region with a high cost of living. San Francisco needs to put more money in the hands of residents who can fuel the local economy. No one should work full-time and live in poverty.